Shown here on the Glen Cove door style in Maple. Arctic White is a Custom Tinted Varnish  nish. Shown here on the Farmington door style in Maple. White Cloud is a Custom Tinted Varnish  nish. Shown here on the Augustine door style in Maple. Villa Ivory is a Tinted Varnish-based Specialty Color. Shown here on the Shelburne door style in Maple. Villa Marshmallow is a Tinted Varnish- based Specialty Color. Villa Mushroom is a Tinted Varnish-based Specialty Color. Shown here on the Sycamore door style in Maple. Villa Pearl is a Tinted Varnish-based Specialty Color. 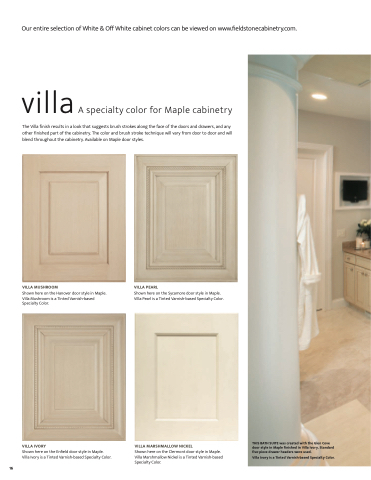 Specialty Colors are cabinetry  nishes that take your room to a whole new level. Artistic effects are added to popular colors to add character and in some cases, a vintage feel.